St. Edward Catholic Church in Fairfield, Illinois can trace its history back to the early 1800's when a group of about twenty Catholic families began to gather. Their desire to build up their lives through the Eucharist and other sacraments led them to search for a priest to serve as their pastor. Circuit-riding priests on horseback visited and celebrated Mass for them in various homes around Wayne County, since there was, at the time, no designated place to worship. In 1878, St. Edward Church was established as a mission of St. Stephen Church, Flora, with Father Riesen as pastor. L.J. Rider and Edward Bonham donated the farmland for a new church, which was constructed of homemade brick and oak timbers, that were cut locally. This Church was dedicated on September 18, 1881 and Father Riesen celebrated the first Eucharist in it. 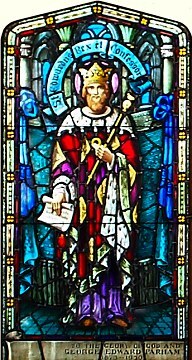 The new church was named after St. Edward the Confessor, eleventh century King of England. On December 12, 1946, Bishop Henry Althoff appointed Father John Walsh as the first resident pastor. The ecclesiastical documents were read constituting St. Edward Catholic Church as a parish and attaching St. Sebastian as a mission. Father John Walsh served in these parishes until the year 1960. Father Stephen Roedder was appointed as pastor in 1960 to succeed Father John Walsh. During this time, the church was remodeled and some portion of land was purchased to extend the church's premises. Father Joseph Callahan served from 1964-1967. He helped with the implementation of changes from the Second Vatican Council in the parish. Father Wilbert Iffert was installed as pastor in 1967 and he served until 1975. By personal choice, a mobile home was purchased for his residence while the big rectory was rather used as parish center. Parish offices, meetings, fellowships and religion classes were all held in the new parish center. Father Jim Dougherty served as pastor from 1975 to 1982. During this time, the Parish Pastoral Council was inaugurated. Construction of the new parish center started in 1978 and was dedicated by Bishop William Cosgrove on October 7, 1979. The main rectory was restored as Pastor's residence. With Father Louis Peterson appointed as pastor in 1982, the parish continued to work very hard to offset the mortgage on the parish hall. When this was done, Bishop Cosgrove was invited to the "Mortgage Burning Party" and he presented a rosary to the parish which is displayed in the parish hall. Father William Rowe served as pastor from 1986-1994. At this time the church underwent a complete renovation. The choir loft was removed and the organ was sold. New music equipment was installed and the first Mass celebrated in the newly decorated church on September 16, 1989. A parking lot was built across from the church and a side porch was added on the south side of the rectory. The basement of the rectory was divided into three classrooms for PSR classes and the church renovation loan was paid off. Father Steve Witte served the parish from 1994-1996. The rectory was renovated at this and the Altar Sodality bought new furniture for the dining room. Father Charles Durkin from the Chicago diocese served as intermediate pastor from October to December of 1996. Father Melvin Vandeloo served as the Parish Administrator at this time. Father Gerald Hechenberger arrived as pastor in February 1996 and served until July 1999. The RCIA program was strengthened and boasted 8 new parishioners during this time. St. Edward's joined the technology revolution with its first computer purchase. Father Henry Ray Engelhart came to St. Edward in July 1999. Rectory repairs were made including new roof, new windows, and a new boiler. A new organ and new music books were purchased. The fire outbreak that engulfed part of the church building on June 26, 2008 was a major upset to the faith community, especially as it happened at the time the parish was juggling up for transition to new pastoral leadership. The parish prayed and hoped that both restoration and transition process would be handled in good faith. Rev. Father Michael Mbonu succeeded Father Ray Engelhart with his arrival on July 8, 2008. The restoration and renovation of the Church was done with the committed efforts of all parishioners. The sanctuary area was redesigned with an extension to accommodate a larger mounted altar. The crucifix, statues, and the tabernacle are permanently placed at strategic positions. The mural of the Most Holy Trinity was painted at the back of the tabernacle. St. Edward parish continued to be a very lively faith community. This is in line with the tradition of faith that has been handed down by countless men and women that laid the foundation of this Church. The food pantry apostolate was broadened to serve both the local people and those from neighboring cities. The parish Mission Statement was formulated and adopted. The first parish website was created and the parish history edited. The entrance door to the parish hall was replaced. St. Edward parish is thankful to God for the past and present, and the parishioners continue to dedicate themselves to God as they journey into the future.